Ah the tyranny of leftovers. Just following New Year’s Eve, I was left with some puff pastry dough, crème fraîche, and ham and two hungry women. (No raising of the eyebrow, please. My mother and Mrs. E.) By good fortune, I had the latest Williams Sonoma catalogue and was able to fake through their recipe for this tart. I added a little grated Gruyère cheese and some eggs and called it brunch. 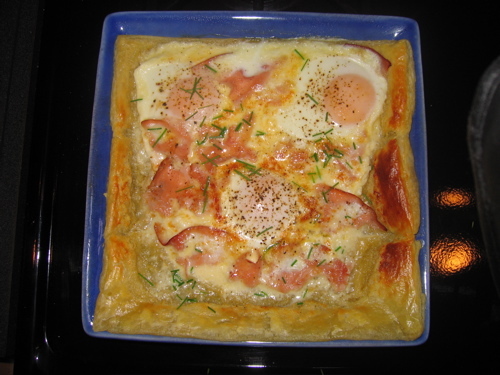 I forgot about the left over “fauxruga,” but we ate it atop the crusts of puff pastry as a sort of amuse-bouche. 1 sheet frozen puff pastry dough, defrosted. Approx. 2 oz. of grated Gruyère cheese. Approx. 3 oz. of crème fraîche. Chives or green onions, snipped with kitchen shears, to garnish. Whip up one egg with a bit of water to make an egg wash. Roll out the puff pastry dough and fold over the sides or score them and lift them slightly. Brush with the egg wash. Toast the puff pastry in the oven on a cookie sheet or a porcelain oven proof plate( be sure to spray it with cooking spray,) for a minute or two just to get the pastry going. Use a fork to prick any dough bubbles that form. Mix the Gruyère and crème fraîche and spread it over the puff pastry. Lay the ham or bacon on top. Sprinkle with fresh ground pepper. Crack the remaining three eggs over the pizza. Cook at 425ºF for approximately 10 minutes or until the egg whites are set and the yolks are still runny. Garnish with the chives or green onion snippings. Serve immediately with a new bottle of champagne as I am sure that you don’t have any bubble left over. This entry was posted in Entertaining and tagged brunch recipes, Williams Sonoma. Bookmark the permalink. I am positive that you could make a pig in a blanket look tempting. Cheese certainly does make everything so yummy. Hearty congratulations on being featured in House Beautiful! Well deserved! Thank you Mrs. PvE, homemade croissant and a locally made apple and smoked chicken sausage with a little Dijon mustard? I am crashing your house next NYE! Last one out, please turn off the lights and turn on the coffee maker. Thanks! Okay, I know where I’m going to brunch next Sunday. My goodness this looks beyond delicious!